The Vedic arya-sastras are divided into two sections—smarta (literature based on smrti) andparamartha (transcendental literature based onsruti). Those who are eligible (adhikari) for thesmarta section do not have any natural inclination or taste for the paramartha-sastras. The thoughts, principles, activities and life goal of every human is constituted according to his respectiveruci (inclination). Generally, smartas accept those scriptures which are in accordance with their respective ruci. Having greater adhikara forsmarta-sastra, they do not demonstrate much regard for paramarthika-sastra. Providence is the agent behind the creation of these two divisions. Therefore, undoubtedly the maintainer of the world must have a hidden purpose in having made such an arrangement. As far as I understand, the purpose is that the jivas sequentially make progress in their level of consciousness by remaining steadfast in their respective adhikara. By deviating from one’s adhikara, one falls down. According to one’s activities, a person attains two types of adhikara—karmadhikara and bhakti-adhikhara. As long as one maintains hiskarmadhikara, he derives benefit from the path shown by the smarta section. When he enters bhakti-adhikara, by transgressing the karmadhikara, then he develops a natural ruci (inclination) for the paramarthika, or transcendental, path. Therefore, providence has made these two divisions of sastra: smarta and paramartha. The smarta sastra has made various types of rules and regulations in order to help one attain nistha, steadfastness, in karmadhikara. In many instances, it even demonstrates indifference towards paramartha sastra to make people attain specific nistha in such rules and regulations. In reality, although sastra is one, it manifests in two ways for the people. If the jiva gives up adhikara-nistha, he can never attain auspiciousness. 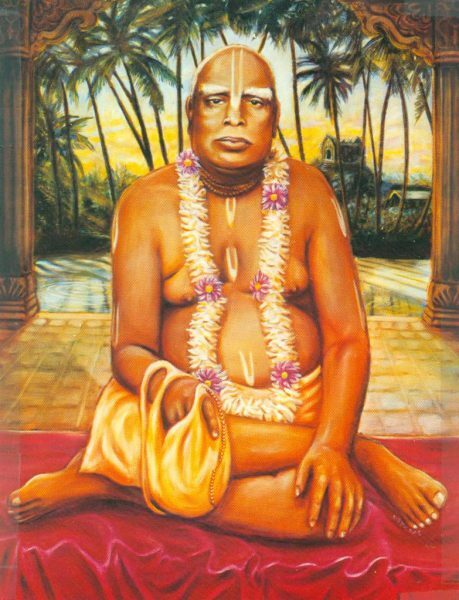 For this reason, the sastras have been divided into two: smarta and paramartha. By dividing the whole year in twelve parts, the smarta-sastras have ascertained the auspicious, or religious, activities for these twelve months. All the karma, religious activities which are part of the varnasrama system when allotted to the twelve months, leave the extra month (adhimasa) devoid of any such activity. There is no religious performance in adhimasa. In order to keep lunar months and solar months in tally, one month has to be excluded every 32 months. The name of that month is adhimasa(extra month). * Smartas have discarded this extra month, considering it abominable. They gave it names such as mala masa (impure month), cora masa (thieving month), and so on. * It is stated in Sri Surya Siddhanta that in one mahayuga there are 1,593,336 extra months and 51,840,000 solar months. Therefore, there is one extra month after every 32 months, 16 days and 4 hours of the solar calendar. Purusottama-masa is glorified in the account of King Drdhadhanva’s previous birth. At Badarikasrama, Narada heard the procedure of the vrata from Narayana Rsi, which Valmiki Muni then related to King Drdhadhanva in answer to the king’s questions. Just as the rules of ahanika (gayatri mantras) for brahmanas are ascertained in dharma-sastras, similarly, the obligatory activities for one observing Purusottama vrata are also delineated, beginning from the brahma-muhurta hour. The worship of Sri Krsna is the obligatory activity of Purusottama month. “Even after taking birth in India, those who are the lowest of mankind remain attached to household life and never hear the glories of Sri Purusottama vrata; nor do they observe it. Such unfortunate persons undergo the suffering of repeated birth and death and the distress inflicted by the separation from sons, friends, wife and other relatives. There are three types of transcendentalists: svanistha — those who are steadfast in their personal vows; paranisthita — those who are steadfast in following the vows set forth by their respective acaryas; and nirpeksa — those who are indifferent to the above two types of steadfastness. * All the activities mentioned above for Purusottama month are prescribed for svanistha transcendentalists. Paranisthita bhaktas are eligible to observe Purusottama vrata according to the rules and instructions of Karttika vrata prescribed by their respective acaryas. Nirapeksa bhaktas repect this sacred month by daily honoring sri bhagavat prasad with one-pointed attention, following some routine for sravana and kirtana of sri harinama according to their capacity. * Svanistha and paranisthita bhaktas are generally householders and nirapeksa bhaktas are renunciates. The bhaktas observe Sri Purusottma month according to their respective adhikara; this means according to the distinctions of the moods of svanistha, paranisthita andekantika bhaktas. Bhagavan Vrajanatha Sri Krsna is the sovereign of this month; therefore, adhimasa is dear to every bhakta. This is because, incidentally, in this month no disturbance from the karma-kanda can come to obstruct the performance of one’s bhakti.